SPL SOLID Differential Mounting Bushings eliminate the stock mushy rubber bushings to hold the differential solidly to the subframe. 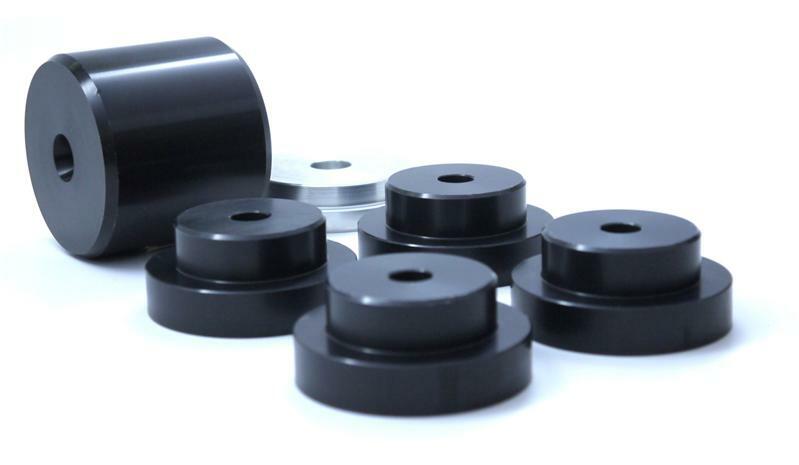 The stock silicone filled differential bushing is notorious for tearing under hard driving (characterized by black streaks on the rear subframe from dried silicone leaked from the bushing). Our bushings will never break, and will keep the differential from “bouncing around” under hard launches/acceleration. This will help prevent damage the drive shaft and half shafts, reduce wheel hop, and improve power transfer to the ground. SPL SOLID Series Bushings are precision CNC machined from T6061 billet aluminum for an accurate fit. Kit includes the bushings on the front of the differential pumpkin as well as the bushing on the subframe where the rear of the differential attaches to. A bushing driver tool is included for pressing the stock bushing out of the subframe.